Are you throwing a birthday party for a total video game nerd? 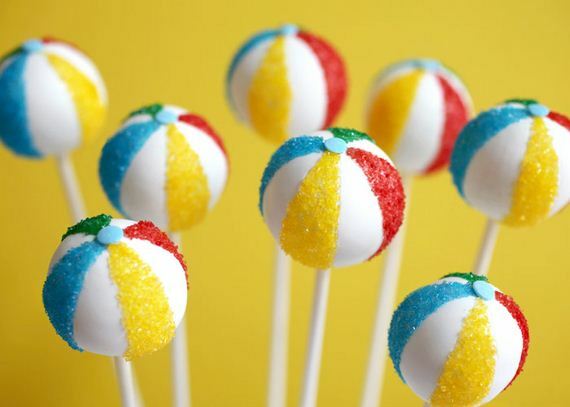 Theme their cake pops after their favourite thing, but go vintage to keep things extra kitschy and unique! 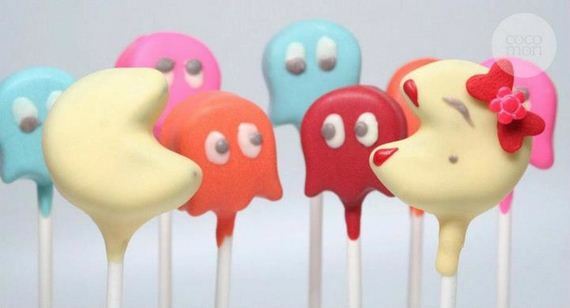 My Modern Met shows you how to make cake pops shaped like the characters from Pac Man! 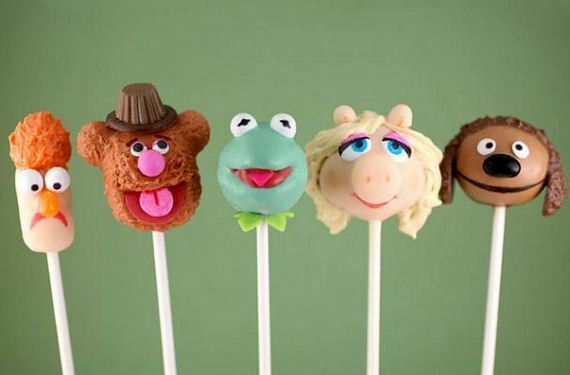 Foodista gets detailed with the icing in these adorable Muppets themed cake pops! The shapes aren’t easy enough, but you’ll sure put your cake decor skills to the test icing the faces and fine details on each character. We’d say they’re worth it! Does your toddler repeat after the Teletubbies every day when they’re on TV? Give him a thrill by having them show up at his next birthday, in a matter of speaking at least. 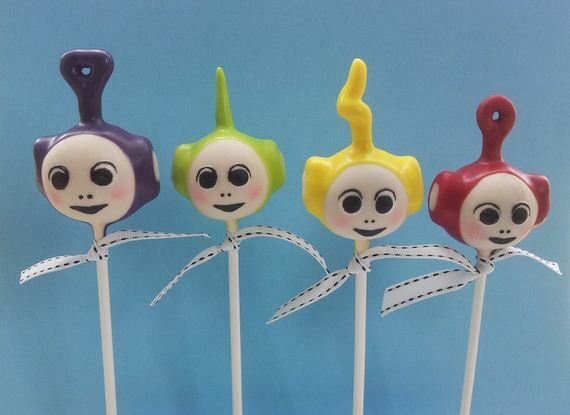 Check out how Creative Cakepops used fondant icing to make these miniature Teletubby cake pop lookalikes. The best part about cake decor of any kind is that you can make cute things to go with any season at all. 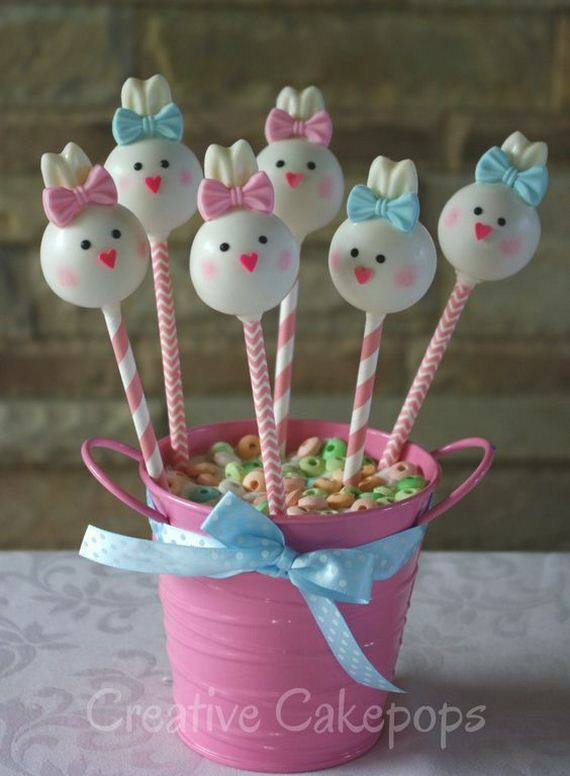 These little bunny cake pops by Cake-Pop are the perfect dessert for after Easter dinner. 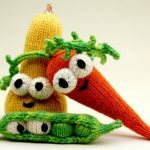 Kids will get a kick out of receiving one last bunny treat now that their Easter egg hunt is over. Does your office participate in Movember to raise money for prostrate cancer each year? At the end of the month, before everyone shaves their “lip sweaters” off at last, celebrate them with these hilarious mustache cake pops! 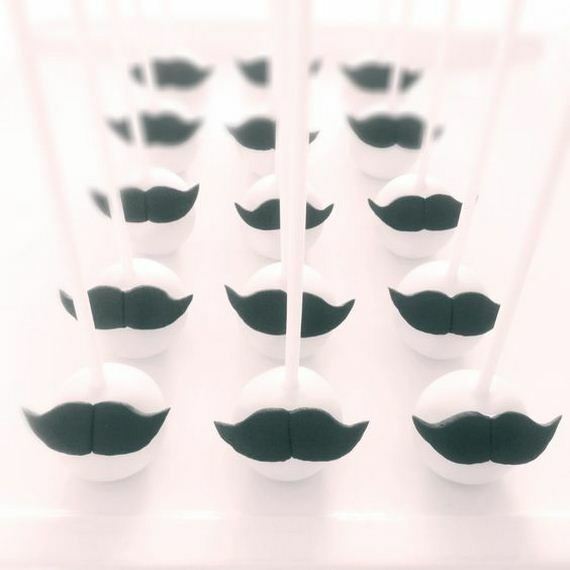 The pop itself is a simple sphere as usual, so just follow in Creative Cakepops foot steps by making little mustaches from black fondant icing. Did you know you can actually buy or make edible metallic paint? They probably have it in the cake decor or baking section of your local craft store. 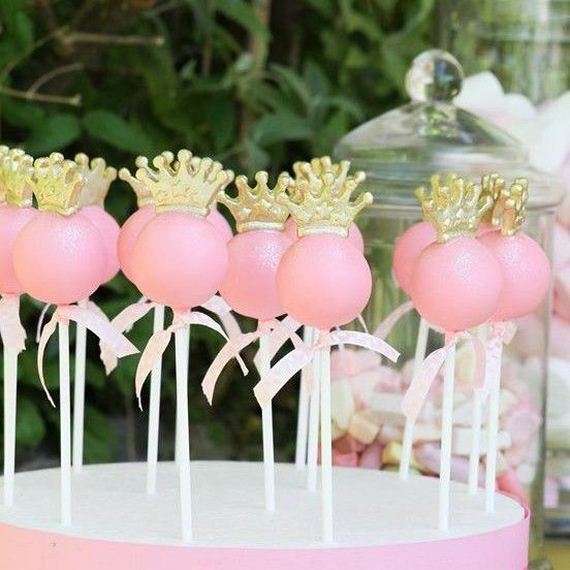 Keep that in mind for when your daughter begs for a cute princess themed birthday party and make her these stunning little pink cake pops with gold-painted fondant tiaras on top, just like these ones from Creative Cakepops. 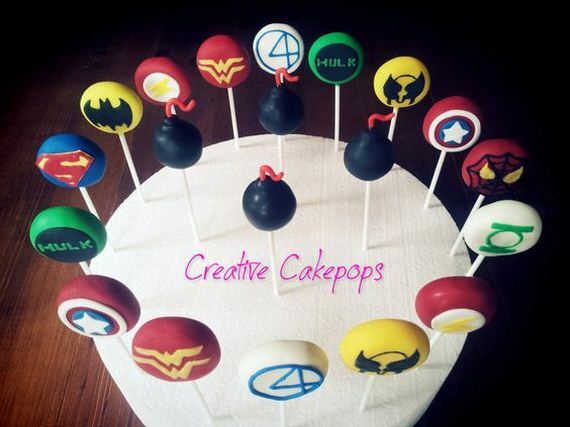 If your husband loves vintage comics but won’t eat a whole bunch of cake because hes watching his waistline, then Creative Cakepops has the perfect birthday solution. These pops are decorate with the symbols of all his favourite heroes, but they’re smaller portions than an entire piece of cake, so he can still enjoy a sweet bite without over eating. Gives you an awesome alternative idea to a big, complicated tiered cake: cake pops arranged to look like a complicated tier cake! These hilarious little dinosaur heads are awesome for a little boy’s birthday party. 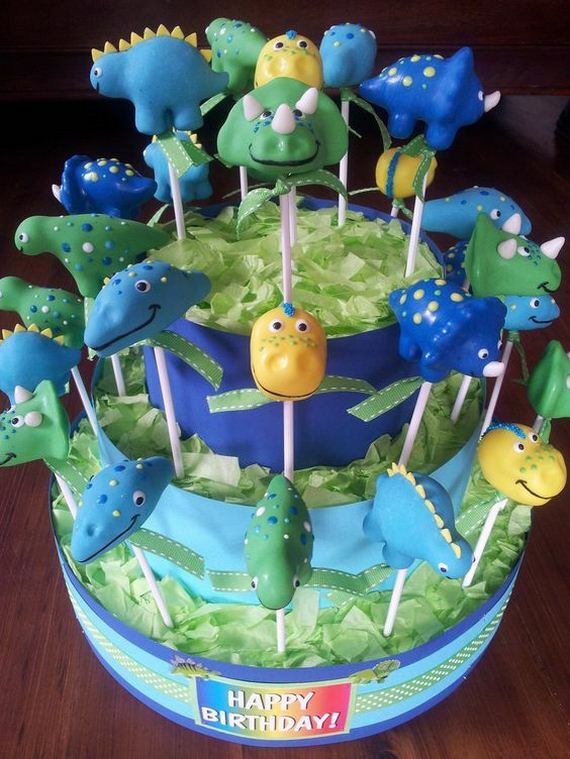 You’ll find a few different dino designs on Creative Cakepops. Who doesn’t a hot mug of coco with marshmallows on top? 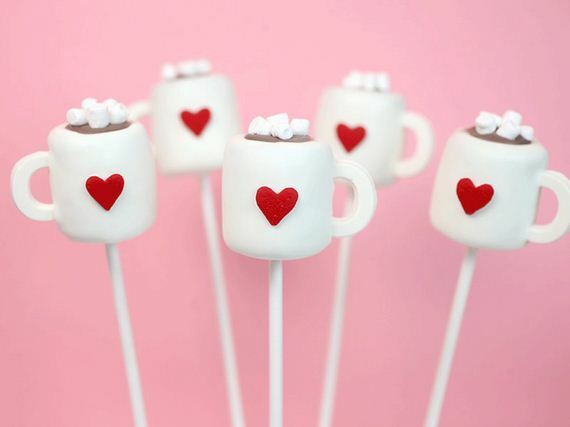 Well, even if you don’t, you’ll probably agree that these adorable little cake pop mugs by Bakerella are an awesome novelty. Adding a tiny red heart to each mug makes them perfect for Valentine’s Day. Niner Bakes is here to remind you that the glory of edible glitter does, in fact, exist! Thes glitzy, glamorous little spheres are perfect for a special Girl’s Night Out, a teen girl’s graduation party, or really just anyone who loves a little sparkle! Your guests will love any design that gets them a treat within a treat! 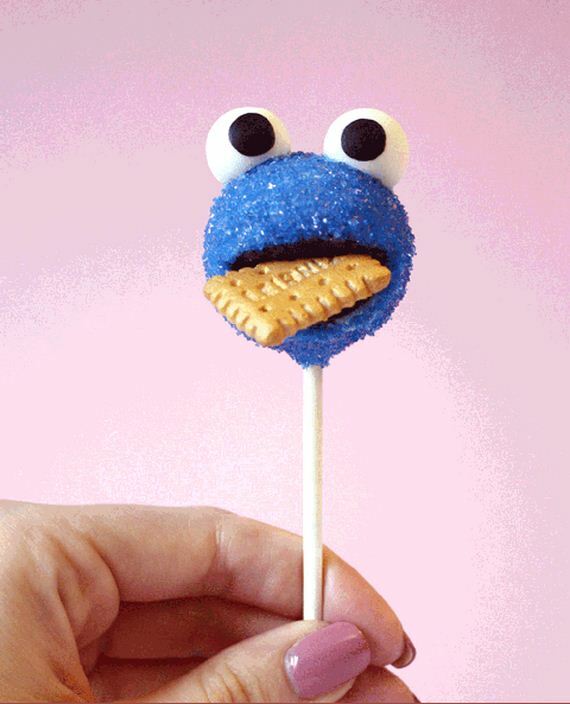 That’s exactly what these little Cookie Monster cake pops do. 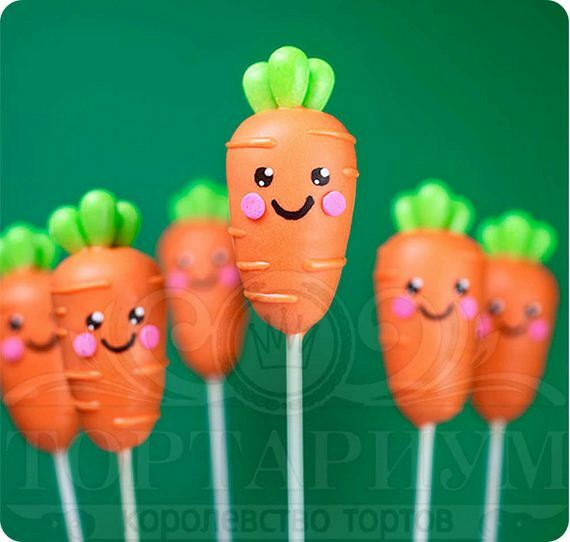 Make regular round cake pops and decorate them with textured blue sprinkles to look like his fur. In each Cookie Monster’s mouth, pop a small cookie, just like Niner Bakes did. No one ever said cake pops have to be round! 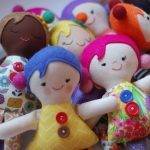 Follow Tiny Me‘s lead and make them a little more oblong so that when it comes time for decor, you can create adorable little carrots with happy faces. 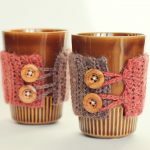 These are great for Easter. 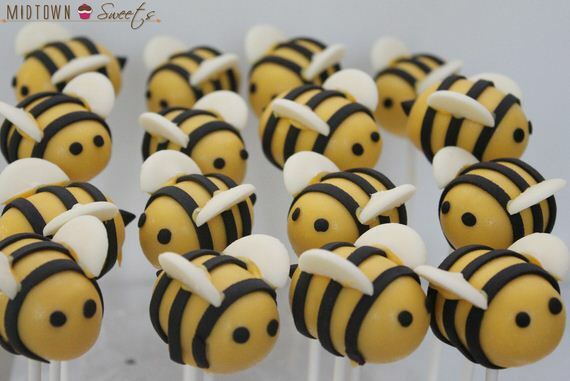 These little bumble bees are an awesome way to start practicing making shapes with fondant. 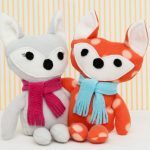 All you need to shape and affix to the bee’s bodies are thin stripes, little circular eyes, and two half-circle wings! 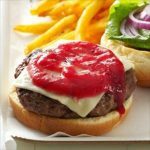 Check out how it’s done on Popsugar. Usually people bring healthy snacks to sports team events, but even athletes deserve a treat every once in a while! 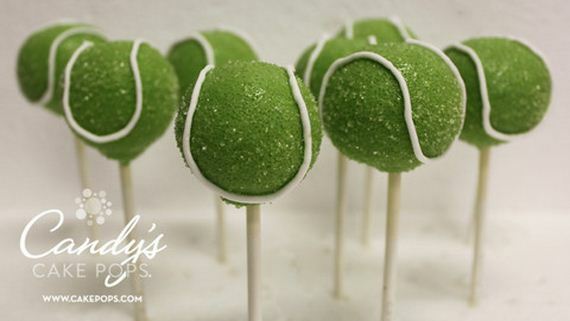 How cute are these simple tennis balls for your tennis team’s end of season party? 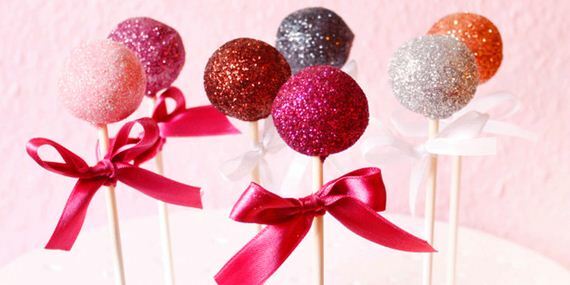 We have Candy’s Cakepops to thank for this idea! Pool parties and beach parties are definitely better with finger foods so that people can snack on to go while they’re busy socializing. We love this beach ball idea from Woman Dot for any watery summer event! They’re easy to do but oh so effective.